Ken Winneg is the Managing Director of Survey Research at the Annenberg Public Policy Center of the University of Pennsylvania (APPC). He is responsible for all facets of the surveys emanating from the Annenberg Public Policy Center, including the Annenberg Institutions of Democracy survey (IOD), and the Annenberg Science Knowledge (ASK) survey. In addition to his survey research duties, Winneg teaches a Penn undergraduate course on new media and politics. Prior to joining the Policy Center, Winneg was vice president at Penn, Schoen and Berland in New York, where he advised a variety of Fortune 100 clients and national candidates on corporate and political strategy. Winneg also was a senior executive at Chilton Research Services, where he managed the ABC News-Washington Post surveys, exit polling for ABC News (1986-1989) and exit polling data collection operations for the consortium of news organizations called Voter Research and Surveys (1990-1992). Winneg continues his association with ABC News as an election day analyst. Winneg earned his M.A. and Ph.D. at the Annenberg School for Communication at the University of Pennsylvania and a B.A. in political science from the George Washington University. His research focuses on political communication, emphasizing online activity and political participation. 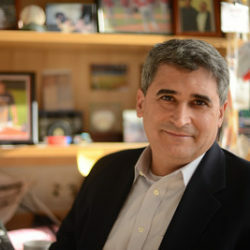 He is co-author of one book, several book chapters, and has published in such journals as American Journal of Political Science, American Politics Research, Political Communication, Presidential Studies Quarterly, Mass Communication and Society, Social Science Quarterly, and American Behavioral Scientist.